Headed to Montauk with the 2010 Ford F-150 SVT Raptor there was one thing I had to get: a picture of all four wheels off the ground. I got it, but it turns out that's not the Raptor's point. Ever since we first got a ride in the Raptor last November, jumping has been the unseen pinnacle to the off-road super truck's performance. With 11.2 inches of suspension travel up front from incredibly heavy duty triple internal bypass Fox Racing shocks, an increased approach angle and beefy front bash plate we knew it was possible, but liability concerns kept Ford from showing anything beyond the limits of the suspension's extension. Then we drove the Raptor in Anza Borrego and, while we did achieve launch velocity, we were prevented from photographing it. But, handed the keys to a bright orange super truck for the weekend and armed with a pass to drive on Montauk's beaches, we suffered no such restriction. The only problem now was finding a suitable jump location. That location needed to meet a few critical criteria. The first and most obvious was the need for a ramp. A suitable one needed to sit at such an angle that it'd launch the Raptor into the air at a relatively sane speed. But some speed (probably somewhere between 30 and 50 MPH) was still needed, so a good couple hundred yards of run up was also required. Of course, all things that go up must come down, creating our biggest concern, the landing. Being relatively unfamiliar with the truck, we couldn't be sure how it'd behave while jumping, so we wanted a large, flat, soft landing area free of debris or anything that could either puncture a tire or possibly even the radiator or oil pan should either get a little too close to the ground. Finding an ideal location proved harder than initially thought. In fact, it took two days of exploring the easterly tip of Long Island's beaches and surprising abundance of trails to find something approaching suitability. Of course, it turned out the ramp we needed was located at the entrance to the beach we first took, we just need to look at it right to see the possibility. You see, in addition to capability, the Raptor is also equipped with limitations. As a stock, showroom-available vehicle, the Raptor has to make a few necessary concessions to things like reliability, user-friendliness and yes, the dreaded legal liability a company the size of Ford is desperate to avoid. Surprisingly, it's not the any of those that labor the Raptor with its only real restriction. The tires, bespoke BF Goodrich K0's designed to work well on-road and off up to the limited 100 MPH top speed, are still able to find adequate grip even in feet-deep soft sand. The stability control is fully-defeatable, defying Ford's liability nazis. No, the problem with the Raptor isn't any of the restrictions conventional wisdom dictates would be included on a truck that comes with a warranty, it's the restriction SVT's engineers had to shoulder in the name of keeping costs low (the Raptor carries only a $2,900 premium over an F-150 FX4). The biggest problem with the Raptor is the damn gearbox. When in Drive (or "D"), the transmission will shift down under load, then the tires will start to spin rapidly causing the transmission to up shift as the engine RPM gets high, once the transmission up shifts the torque at the wheels goes down and the engine "bogs", then the transmission down shifts and the whole cycle starts over again. Ford plans to correct this issue with the 6.2-liter Raptor coming out next year. We'd originally dismissed this jump location because the Raptor couldn't carry adequate speed through the soft sand of the approach road. Even hitting the 50-yard long soft spot at speed simply resulted in bogging down. It's not like the Raptor would get stuck, it just shed all its speed. But, two days of driving back and forth over that sand had compressed it enough that hitting it at 50 MPH only resulted in slowing to about 30. Still enough to catch air. Thus the pictures you see here were captured. Anti-climatic? You bet. All this work and we're neither the first to bring you a shot of the Raptor in mid-air, nor can we bring you the highest jump. So it's lucky that spending two days searching for a ramp wasn't a total waste, driving the Raptor on a beach is hilarious good fun. 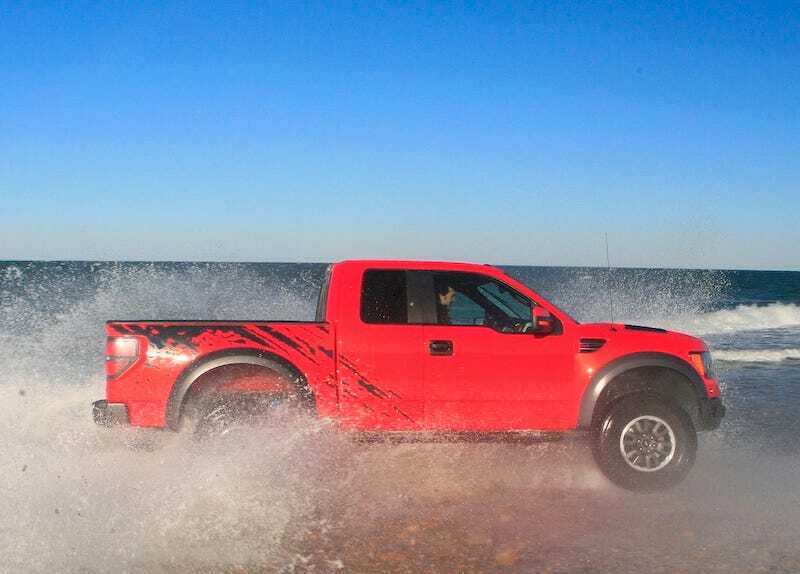 Despite the tendency of the transmission to occasionally do exactly what you don't want it to do, the Raptor will still run through soft sand at incredibly high speed. We saw 85 MPH before we had to slow for some boulders. They were about the only objects capable of stopping the Raptor, even the numerous foot-deep furrows we'd carved in the sand with 48 hours worth of donuts failed to translate into huge bumps in the cabin or stop the truck from tracking straight. In comparison, a dirt bike I had out here a couple of weeks ago couldn't hit more than about 20 MPH in the same conditions and I fell over, a lot. It's easy to get flippant about the Raptor's capabilities in the absence of comparison. It just takes everything you throw at it in stride. Can it slide horizontally into and over a foot-high ledge without flipping? Yes, I can definitively state that it can. Thank the 7-inch wider track for that. Can it drive through the ocean up to its doors without losing traction, swallowing water or flooding the cabin? Test completed successfully. Can it walk itself out of deep sand after you bury it up to the axles? Easily. I never would have tried any of those things in another pickup or SUV. The fact that the Raptor did all that, then carried me and a back seat full of friends back to the city in luxurious comfort is the reason we named it one of Jalopnik's Best 10 Cars Of The Decade. If Ford really is able to cure the only real flaw in the Raptor's recipe - the stupid, stupid, stupid gearbox - then we might just have to invent some new plaudits to hang around the super trucks bright red neck.